Cave of Altamira and Paleolithic Cave Art of Northern Spain is the name under which 18 caves located in different regions of northern Spain are grouped together as a World Heritage Site. These caves are located in three autonomous regions: Cantabria, Asturias, and the Basque Country. Altamira Cave was declared a World Heritage Site in 1985. In 2008 the site was expanded to include the 17 additional caves. The caves contain Paleolithic cave art dating from approximately 35,000 to 11,000 B.C.E. During this time the first Homo Sapiens arrived in Northern Spain where they cohabited with the Neanderthals for a time. The earliest cave paintings were developed during this early period of the Upper Paleolithic. During the latter years of this period, known as the Magdalenian, a unique style of realistic portrayals developed in Cantabria. In 2012, a hand print and a red dot in the Cave of El Castillo were dated to an earlier period, at least 37,300 years and 40,800 years ago respectively, making these the oldest examples of cave art to be discovered in Europe, several thousand years older than those in Chauvet Cave. The artwork in these caves was well preserved for thousands of years in deep caverns which were isolated by rockfalls from the outside climate. In order to protect the paintings from damage many of the caves are now closed to the public, with replicas and museums constructed so that the beauty of these ancient artworks by our distant ancestors can be enjoyed safely. Chief among the caves in this World Heritage Site is Altamira, located within the town of Santillana del Mar in Cantabria. It remains one of the most important painting cycles of prehistory, originating in the Magdalenian and Solutrean periods of the Upper Paleolithic. This cave's artistic style represents the Franco-cantabrian school, characterized by the realism of its figural representation. The cave is 270 meters (890 ft) long and consists of a series of twisting passages and chambers. Around 13,000 years ago a rockfall sealed the cave's entrance, preserving its contents until a nearby tree fell and disturbed the rocks, leading to its discovery by a local hunter, Modesto Peres, in 1868. However, it was not until 1879 that the images of animals were noticed. Local amateur archaeologist, Marcelino Sanz de Sautuola, began to study the paintings together with archaeologist Juan Vilanova y Piera from the University of Madrid, resulting in a much acclaimed publication in 1880 which interpreted the paintings as paleolithic in origin. However, due to the artistic quality of the paintings, and their exceptional state of conservation, this interpretation was questioned and Sautuola was accused of forgery. Later findings of prehistoric cave art in other caves eventually led to acceptance of their work. Further excavations in the cave floor found artifacts of the Upper Solutrean (dated at approximately 18,500 years ago) and Lower Magdalenian (dated between 16,500 and 14,000 years ago) periods. Human habitation was limited to the cave mouth but artwork was discovered on the walls throughout the cave. Solutrean paintings include images of horses, goats, and hand prints created from the artists placing their hands on the cave wall and applying paint over them leaving a negative image of the palms. Art dated to the Magdalenian occupation also includes abstract shapes. The cave itself is no longer open to the public, in an attempt to preserve the paintings which became damaged by the carbon dioxide in the damp breath of large numbers of visitors. A replica cave and museum were built nearby, effectively reproducing the cave and its art. In addition to Altamira, the World Heritage Site includes nine additional caves located in Cantabria. 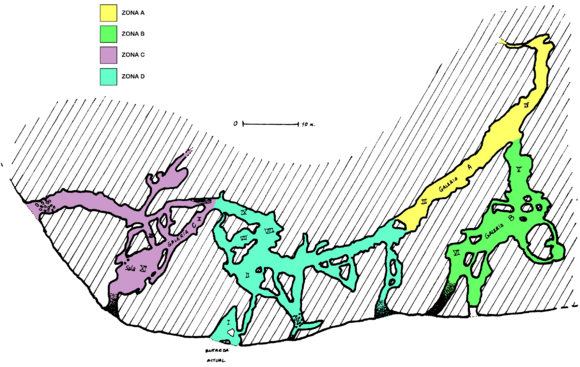 These are Cave of Chufín; Cave of Hornos de la Peña; Cave of El Pendo; Cave of La Garma; Cave of Covalanas; and the Complex of the Caves del Monte Castillo in Puente Viesgo which includes the following chambers: Cave of Las Monedas, Cave of El Castillo, Cave of Las Chimeneas, and Cave of La Pasiega. The Cave of Chufín is located in the town of Riclones in Cantabria, in an area of the Nansa River Valley which has steep cliffs. 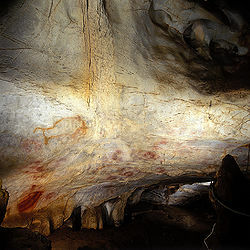 The cave and its artwork was discovered by Manuel de Cos Borbolla, a local photographer. At the entrance of the cave are a number of figures etched into the rock. Further inside, in several halls are images of animals, including bison, horses, deer, and goats. The paintings date from between 16,000 and 11,500 B.C.E. 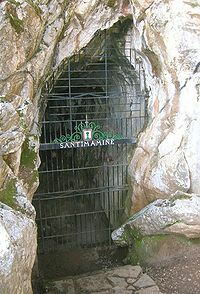 The Cave of Hornos de la Peña is situated on a hill near the village of Tarriba in San Felices de Buelna. It was discovered in 1903. The most notable paintings are a headless bison, horse, and others at various levels in the first room and the second set of 35 figures are animals such as horses, bison, aurochs, goats, and other animals. The dating of the paintings indicate that they were created in the initial or middle Magdalenian period. The Cave of El Pendo is situated in the heart of the Camargo Valley. The cave measures up to 40 meters (130 ft) in width and 22 meters (72 ft) in height, and dates from around 20,000 B.C.E. The ‘Frieze of Paintings,’ a panel measuring 25 meters (82 ft) in length is visible from any point in the main hall. This panel contains a number of figures painted in red, including several deer, a goat, a horse, and various other symbols, all drawn using the contour technique. The Cave of La Garma is located on La Gama Mountain. It is divided into various levels: the upper hall contains human burial sites; the intermediate level has a large number of palaeontological remains, mainly bones; the lower level consists of three, intact areas with many examples of painted art. They date from 28,000-13,000 years ago. The paintings include a realistic black horse, goats, bison, panels with hands, as well as many symbols painted in red. The Cave of Covalanas was first discovered to have art work in 1903, though the cave was well known to the locals who knew it as "la cueva de las herramientas" (Tools Cave). It is situated on the South-Western hillside of Pando mountain, very close to the village of Ramales de la Victoria. It has two galleries, one of which contains rock paintings. There are 22 red images: 18 are of deer, a stag, a horse, an aurochs, and a hybrid-type figure. There are also several symbols, small dots, and lines. The figures are distinctive for their technique, with a stippled outline made with the fingers. Given the limited use of this technique, a possible "Escuela de Ramales" (School of Ramales) has been postulated, establishing chronologically this kind of painting between 20,000 and 14,400 years ago. 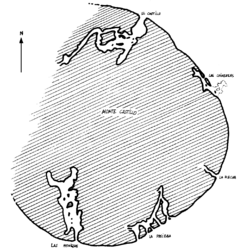 Map showing locations of the caves on Monte Castillo. 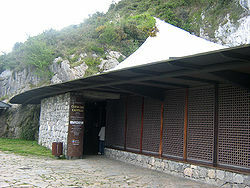 The Caves of Monte Castillo, located in the Cantabrian town of Puente Viesgo, contain one of the most important Paleolithic sites in the region. These include the caves Las Monedas, El Castillo, Las Chimeneas, and La Pasiega. This set of caves is located along the Pas river in the Castillo mountain, squarely at the intersection of three valleys and near the coast. This is a fertile ground for agriculture, hunting, and fishing, which explains the emergence of several prehistoric settlements there. The caves contain decorations in red ochre in the forms of hand stencils (from as far back as 35,300 B.C.E.) and dots. One dot has been dated to 40,800 B.C.E., making it the oldest dated cave decoration in the world as of 2012. The Cave of Las Monedas was named the Bear Cave upon its discovery in 1952. Later, a collection of 20 coins from the days of the Catholic Monarchs were discovered in a sinkhole, leading to the renaming of the cave "Las Monedas" (coins). The cave is 800 meters (2,600 ft) in length, and contains stalactites, stalagmites, columns and colored karst formations. The paintings, which date from around 10,000 B.C.E., are located in a small side grotto. They include animal figures (horses, reindeer, goats, bison, and a bear) as well as groups of symbols. The Cave of Las Chimeneas (Cave of the Chimneys) was discovered in 1953. The chimneys are limestone shafts connecting the two levels of the cave. There are several panels of macaroni-type engravings, made with the fingers on clay. There are also black paintings, representations of animals and quadrangular symbols. Two of the figures (a deer and a symbol) are dated 13,940 and 15,070 B.C.E. respectively. Access to the cave, in April 2008. Cueva de El Castillo (Cave of the Castle), was discovered in 1903 by Hermilio Alcalde del Río, the Spanish archaeologist, who was one of the pioneers in the study of the earliest cave paintings of Cantabria. The entrance to the cave was smaller in the past, but it has been enlarged as a result of archeological excavations. Alcalde del Río found an extensive sequence of images in a number of different chambers. After the first studies in the cave, the vestibule of Castillo was excavated by the Institut de Paleontologie Humaine at Paris, directed by Hugo Obermaier and Henri Breuil, between 1910 and 1914. The cave art was studied at the same time, with the collaboration of Alcalde del Río and several other archaeologists. In the 1980s the excavation of the stratigraphy at El Castillo was restarted, and nearly thirty archaeological layers were able to be differentiated, from the late Acheulian about 150,000 years ago, to the end of the Upper Paleolithic, and even more recent prehistoric periods. This long sequence covers the transition from the Neanderthal populations of the Mousterian period and the Homo sapiens of the Aurignacian and later Upper Paleolithic periods. The results demonstrate that the tradition of decorating caves extends back at least to the Early Aurignacian period, with minimum ages of 40.8 thousand years for a red disk, 37.3 thousand years for a hand stencil, and 35.6 thousand years for a claviform-like symbol. These minimum ages reveal either that cave art was a part of the cultural repertoire of the first anatomically modern humans in Europe or that perhaps Neanderthals also engaged in painting caves. Cueva de La Pasiega, or Cave of La Pasiega is also located in the same group of caves as Las Monedas, Las Chimeneas, and the cave of El Castillo. La Pasiega is basically an enormous gallery, its known extent more than 120 meters (390 ft), that runs more or less parallel to the slope of the mount, opening to the surface at six different places: six small mouths, the majority obstructed, of which two can be accessed for inspection. The principal gallery is approximately 70 meters (230 ft) and opens to deeper secondary galleries, winding and labyrinthine, which in places broaden out to form large chambers. The recorded remains belong mainly to the Upper Solutrean and the Lower Magdalenian ages, although older objects are also found. Throughout the cave are many 'walls' with paintings and with engraved or incised images. There are representations of equines (horses), cervids (deer, male and female) and bovines (cattle). There are also many abstract symbols (ideomorphs). The scientific discovery of the La Pasiega can be credited to Wernert and Hugo Obermaier. While excavating the cave of El Castillo in 1911, they received news that the workers knew of another cavity nearby that villagers called "La Pasiega." The investigators soon confirmed that the cave contained rock paintings. Later, Henri Breuil, Hugo Obermaier, and Hermilio Alcalde del Río began their systematic study of the cave, an account of which was published in 1913. The cave is around 400 meters (1,300 ft) long with artwork in four galleries referred to as A, B, C, and D. Several hundred images of animals as well as symbols are contained in these galleries. They date from the Solutrean to the early Magdalenian from 19,000 B.C.E. to 14,000 B.C.E. Gallery A contains pictures of horses, bison, aurochs, deer, reindeer, and goats painted primarily in red, but also some images are black and some are engraved. In a narrow gallery further inside are several quadrilateral signs. This gallery is dated to the Solutrean, with some figures from the early Magdalenian. Gallery B contains red and engraved images of aurochs, bison, horses, megaloceros, goats, chamoises, and claviforms near the original entrance. These are from the early Magdalenian. In Gallery C, figures of horses, bison, goats and others have been found painted in red, yellow, violet, black and even engraved traces. There are also symbols, including claviforms painted red. The period of these paintings is dated to the Solutrean and some of the Magdalenian. Finally, Gallery D is a zone with horses, bison, deer, and quadrangular signs. Again these works are from the Solutrean to the Magdalenian. Five caves are located in Asturias, all situated in the Comarca de Oriente: Cave of Tito Bustillo in Ribadesella, Cave of Candamo in Candamu, Cave of La Covaciella in Cabrales, Cave of Llonín in Peñamellera Alta, and Cave del Pindal in Ribadedeva. The Cave of Tito Bustillo was formerly known as Pozu´l Ramu. It was renamed in 1968 after one of a group of young men, including Celestino Fernández Bustillo, rappelled down into the cave and discovered the artwork. He died in a mountain accident a few days later and the cave was renamed in his honor. Prehistoric paintings cover a large portion of the Cave of Tito Bustillow, with many painted over earlier works. The dating of the art ranges between 22,000 and 10,000 B.C.E. There are two especially significant sections: the Chamber of Vulvas which contains paintings of female forms, and the Main Panel which consists of numerous animals. The drawings of the female body, however, are of especial interest as they make use of the natural relief of the rock to suggest the three-dimensional form of the body. The Cave of Candamo is around 60 meters (200 ft) long and was discovered in 1914. 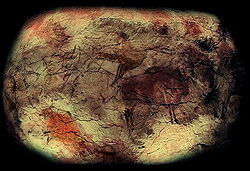 The paintings are from the Solutrean period, of the Upper Palaeolithic, some 18,000 years ago. The cave consists of several sections, beginning with the Entrance Gallery. The hall of the engravings contains the most important panel in the cavern: the wall of the engravings, a complex collection of figures including deer, horses, bison, goats, a chamois, and other animals which are difficult to identify. The techniques used are varied, mixing painting and engraving. The Camarín, at the end of this hall, contains a stalactite waterfall, on top of which is a panel of bovids, horses, a goat, and an incomplete image of a bull. These animal images, created by climbing the large calcite formations, ladders, or scaffolding, are visible from all points of the main central chamber in the interior of the cave. This hall also contains the Talud Stalagmite, a mural with figures of horses which precedes access to the Batiscias gallery. In the Hall of the Red Signs, we can see signs in the form of dots, lines and other symbols which some interpret as feminine and masculine. The cave of La Covaciella is located in the area known as Las Estazadas in Cabrales (Asturias). It was discovered in 1994 completely by chance when several of the local inhabitants entered the grotto through an opening which had been made during road construction. La Covaciella is formed by a gallery 40 meters (130 ft) long which opens out onto a great chamber. Its interior space was sealed when the original entrance was blocked due to natural causes. Although closed to the public, the prehistoric art in this cave can be enjoyed at the visitor centre in Casa Bárcena in the village of Carreña de Cabrales. The paintings date back more than 14,000 years. Also known as "La Concha de la Cueva," the Cave of Llonín is located in a narrow valley on the banks of the Cares River. The cave runs for 700 metres and contains around thirty prehistoric engravings and paintings. These include images of deer, reindeer horns, goats, snakes, and a bison. Cueva del Pindal is located near the town of Pimiango in Asturias, near the border of Cantabria. The cave is 300 meters (980 ft) long and has numerous cave paintings, mostly on the right-hand wall. The cave paintings were discovered in 1908. They include several bison and horses, with a duo comprising a bison and a horse as the main motif. There are also other creatures represented, including a fish and a mammoth, as well as symbols, dots, and lines. Both red and black colors were used. Their estimated age is between 13,000 and 18,000 years. Three caves are located in the Basque Country. Located on the eastern slopes of Beobategaña Mountain, Altxerri Cave contains rock engravings and paintings from the Magdalenian period, dating between 13,000 and 12,000 B.C.E. The engravings are well preserved. The paintings, however, have deteriorated on account of the damp, leading to the cave being closed to the public. The Cave of Ekain was already known to the people in the village of Sastarrain in Guipscoa, when the cave art was discovered in June 1969. The accessible part of the cave was small, but to the right of the entrance some boulders had blocked a small opening. When these boulders were moved aside, a larger passage was revealed, that runs for 150 meters (490 ft) and contains numerous paintings and engravings. There is a large panel full of paintings of horses. In addition to horses, there are also other animals such as bison, deer, and goats. The Santimamiñe cave, is located in Kortezubi, Biscay, Basque Country on the right bank of the River Urdaibai and on the foothill of Ereñozar Mountain. The cave paintings were discovered in 1916 when some local boys explored them. It is best known for its mural paintings of the Magdalenian period, depicting bison, horses, goats, and deer. It is one of the most important archaeological sites of the Basque Country, including a nearly complete sequence from the Middle Paleolithic to the Iron Age. ↑ 1.0 1.1 Alistair W.G. 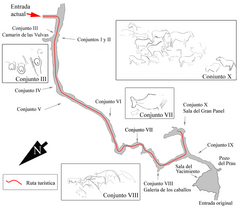 Pike et al., "U-Series Dating of Paleolithic Art in 11 Caves in Spain" Science, 336(6087) (June 15, 2012): 1409-1413. Retrieved October 10, 2013. ↑ 3.0 3.1 César González Sainz and Roberto Cacho Toca, Castillo Cave, Cantabria. Retrieved October 10, 2013. ↑ Jean Clottes, Chauvet Cave: The Art of Earliest Times (University of Utah Press, 2003, ISBN 978-0874807585). ↑ Jonathan Amos, Red dot becomes 'oldest cave art' BBC News, June 14, 2012. Retrieved October 10, 2013. ↑ Henri Breuil, Hugo Obermaier, and Hermilio Alcalde del Río, La Pasiega à Puente Viesgo (Monaco: Chêne, 1913). ↑ César González Sainz and Roberto Cacho Toca, Peña de Candamo Cave, Asturias Retrieved October 10, 2013. ↑ César González Sainz and Roberto Cacho Toca, Ekain Cave, Guipscoa, Basque Country Retrieved October 10, 2013. 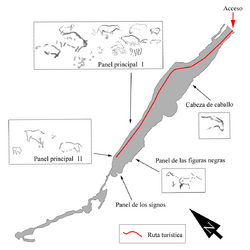 History of "Paleolithic Cave Art of Northern Spain"
This page was last modified on 11 January 2019, at 19:42.